Home > Africa Travel Writing and Photos > Rhino Party at the Waterhole. 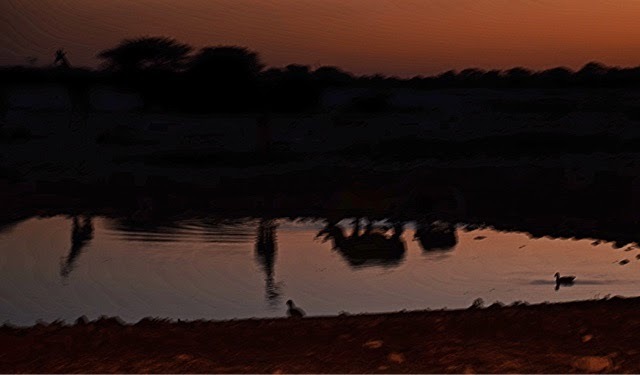 The campgrounds and lodges at Etosha National park have viewing areas of waterholes, and they even light them for a couple of hours at night. Mom and I watched an incredible interaction unfold one night with the endangered black rhinos, and even though we were freezing we sat there and shivered for two hours because we did not want to miss anything. The Rhino Party started with a large single male black rhino sharing the waterhole with three giraffe. Soon, a mother rhino and her calf wandered down to drink. Eventually eight rhino, including two mothers and calves were at the waterhole at the same time. They apparently have a standing appointment between 8 and 10 pm every night. They live alone, and wander in alone and solitary. But they are social animals, and they gather at the waterhole and interact together – coming together in groups with heads together snorting and huffing and touching horns. This inevitably leads to one of them getting offended, where they will throw their heads up and stomp backwards, snorting in clouds of dusts. They will face off and snort and stare each other down for a few minutes. Then one will charge the other – the mothers are particularly defensive of their young and keep themselves between the male rhinos and the babies. The calves stick right at Mom’s side and mimic every move, except for the charging, when they linger safely behind. Two mothers separately backed of this huge male, and at one point ganged up on him to send him back to the outer edges and safely away. One of the rhino calves looked older and we believe was the equivalent of a teenage boy – he was clearly learning how to be a proper rhino. We watched Jr. go greet other rhinos on his own and pick fights. When Mom decided it was serious she would whirl around and intervene, and Jr. would run behind her to hide. Eventually around 10 pm the rhinos slowly wandered off, weaving their way into the darkness in different directions. 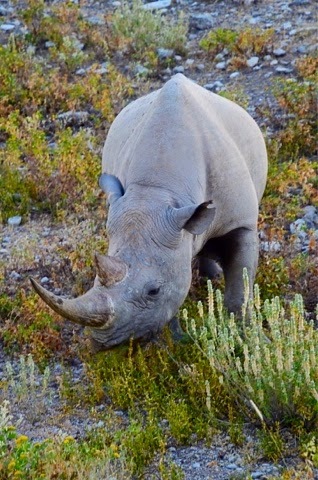 Over 40 rhinos have been poached in Etosha since November. Most poaching had been happening outside of the parks – mostly at private game reserves – but there are now so few rhinos left they are targeting parks to get the horns, even though the risk is higher. The poaching is done by local people for a fraction of the profits gleened by the Chinese interests who fund the illegal trade. There are just over 1000 rhinos now in the park, and many were relocated here for their protection and have thrived in the park until now. The authorities believe the poachers have inside help from park employees who are being paid off to tell poachers the likely location of the rhinos … necessary to find them in this huge park. But the government, along with the conservation organization Save the Rhino Trust have ramped up security and now have helicopter patrols circling to try and deter and spot poachers in the park. I fear that in these poor countries with food shortages and a selfish outside market willing to pay huge money for horns, that these animals are unlikely to survive much longer. I’m grateful to have seen this while I can. And will be making a donation to the Rhino Trust in hopes they can work a miracle and save these fabulous creatures.